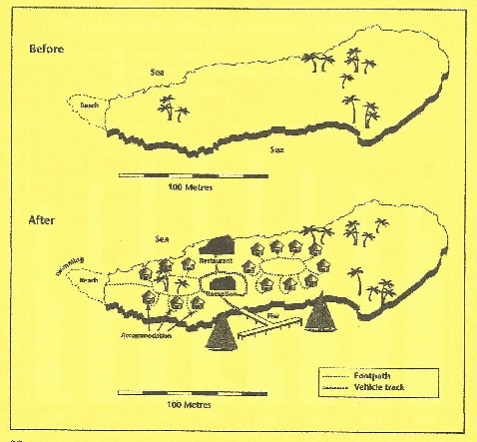 The first map illustrates the appearance of a particular island before constructing some tourist facilities, while the second map depicts how that island changed after developing as a tourist attraction. Overall, it can be clearly seen that there are significant differences between the two maps. At first glance, the island is approximately 200 metres long. The first map shows that there are some coconut trees in the location. Firstly, there is a reception block in the centre of the island and it is surrounded by a vehicle track. Moreover, this vehicle track runs also to the restaurant and to the pier which are situated in the North and the South of the reception. There are some accommodation blocks in the west and the east of the reception and people can reach them only through foot paths. Tourists can also swim in one side of the beach which is in the west of the island. It can be reached through a foot path. It should be noted that now people can go easily for boat trips in the sea when they go to the sea side, where the pier is built. Interestingly, the coconut trees in the eastern and western part of the island are still there in the island. 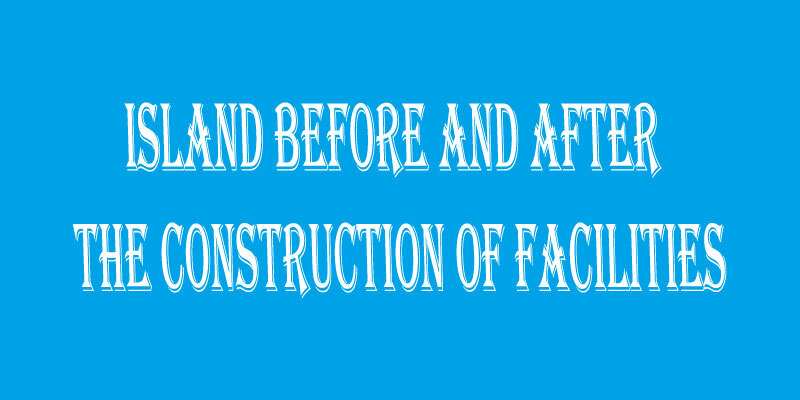 Finally, now there is wide range of facilities available for tourists.